I don’t know why it is, but for all that my Kindles claim they download and apply updates automatically, neither my old Kindle Touch nor my more recent 6th-generation Kindle Paperwhite ever has. As a result, I ended up finding out about the new update from The Digital Reader, and had to go to the Amazon firmware page to apply it manually. The new update, v5.8.1, is available for the Voyage, 6th and 7th generation Paperwhites (the 5th generation Paperwhite is out of luck), and 7th generation Kindle. The update process was pretty simple once I had the file—I just needed to copy it across to my Kindle via USB, open the menu, choose “Settings,” open the menu again, and choose the “Update my Kindle” option. 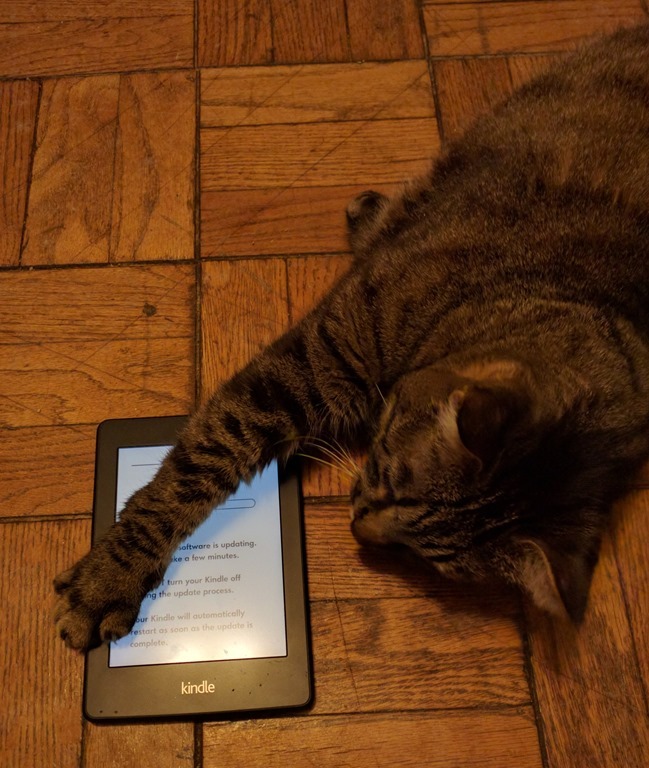 The Kindle rebooted, spent a while applying the update (with a little help from my cat, Benji!) and it was ready to go. Reading Progress Dots: We listened to feedback from our customers and brought reading progress dots back to your library. 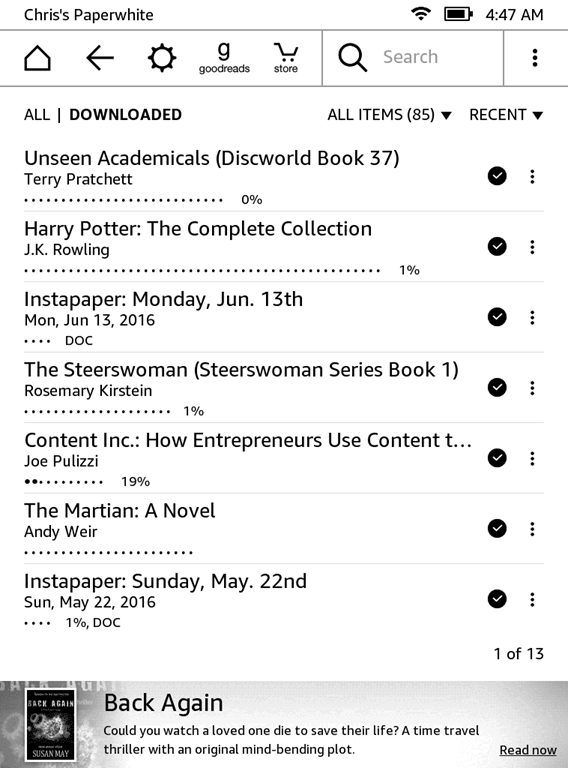 You can now see reading progress and relative book length for downloaded books in the library list view. More Ways to Share: Recommend books to friends from About This Book. Kindle Unlimited Recommendations: Try Kindle Unlimited for free and see recommended Kindle Unlimited titles after choosing your favorite genres. Save Wi-Fi Passwords to Your Amazon Account: Save your Wi-Fi passwords to your Amazon account for future convenience. We can configure your compatible devices so that you won’t need to reenter your Wi-Fi passwords on each device. And sure enough, those features are there. 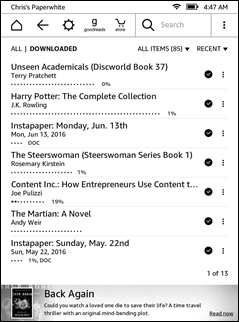 The dots show up in the list view of your library—if you’re stuck with the new “Home Screen View” Amazon pushed out in the previous firmware update, you have to tap on “Library” to see it. You can disable that “Home Screen View” under Menu –> Settings –> Device Options –> Personalize your Kindle –> Advanced Options. (And three cheers for Amazon for making that option so easy to find!) Once you load the Library list, there it is. The bolded dots represent the portion of a book you’ve read, and they only appear under books that are actually on the device. Whether you downloaded the book from Amazon or synced it on with Calibre doesn’t seem to make any difference. The only odd thing I’ve noticed is that some of my books have “DOC” after the row of dots—the ones I downloaded from the recent “Write Stuff” StoryBundle, in fact. 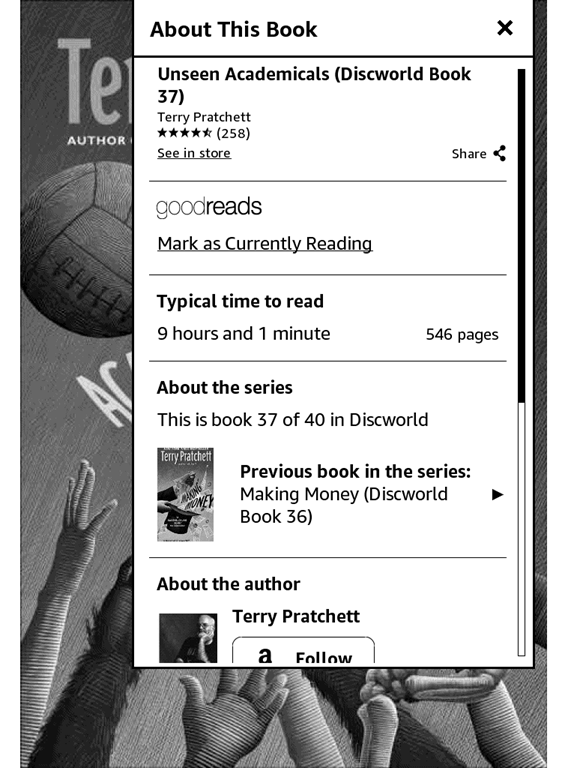 I can’t see why, because in my Calibre they show up in EPUB and MOBI format, not DOC, and other books I’ve sideloaded as MOBI don’t get that indicator. Oh well; it doesn’t affect how they look when I read them, anyway. Can anybody tell me why? One other weird thing: when I downloaded Unseen Academicals, a book which I have never before even opened, it showed up on my Kindle as 97% read, open to the list of publishers’ addresses at the back of the book. (I paged back to the beginning before I took this screenshot.) I welcome any speculation as to the possible reason for that, too. I will note that the “relative book length” feature falls down when it comes to extremely long books such as Harry Potter: The Complete Collection. If the length of the row of dots is intended to denote relative length for each book, the dots for that monster omnibus should occupy about four or five rows of the screen! Clearly, it has its limitations. 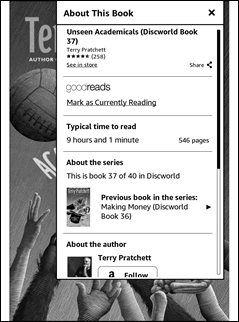 In any event, the sharing menu is just the same regardless of how you open it: it gives the choice to share on Goodreads, Facebook, or Twitter. If you share a quote, it will include a link to a page on read.amazon.com with your quote and the option to begin reading the book’s sample for free. Might be handy if you’re in the habit of coming across quotes that you just have to share. You can customize the message, so if you need to add a hashtag or a @twitterID before sending, you can do so. Remembering Wi-Fi passwords is a largely invisible option, and simply takes effect whenever you enter a new Wi-Fi password somewhere. There’s an option to disable that memory feature, buried in the same submenu as the option to disable the Home Screen View (for which, see above). About the only new option I couldn’t easily find is that business about trying Kindle Unlimited. There’s nothing about it either in my list view, or on the Home Screen View about it. It’s not in the “My Reading Lists” section, either, nor anywhere in the menu bar along the top, or the menu that pops up if I tap on the three-dot menu button in the top right. I’m really downright puzzled here—if I wanted to try Kindle Unlimited from my Paperwhite, how would I even do it? As Nate Hoffelder notes on The Digital Reader, the 6th-gen Paperwhite doesn’t get Amazon’s new VoiceView feature added to it; one of the comments notes that Paperwhite only has 256 megabytes of memory, and the Ivona VoiceView feature requires at least 512. VoiceView is currently available only to the Oasis, the very latest Paperwhite, and the Voyage (with an extra update installed). In any event, I think the dots are a nice way to tell at a glance how far along in a book you are—the equivalent of being able to judge based on how many pages are on the left side of a paper book versus how many are on the right. It’s not something I was clamoring for, and I didn’t especially miss it when it was gone, but I don’t mind having it back. I can take or leave the sharing option, as I’ve never been one to do a lot of that sort of thing. And saving Wi-Fi passwords will be nice if I’m inclined to use the Kindle a lot on multiple passworded networks. Still no sign of an all-bold font option, of course. 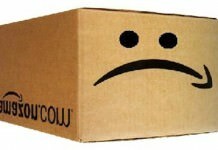 But if that ever does come about, I expect Amazon will make it fairly obvious. Previous articleAre we moving toward a one-OS world? The DOC label is probably short for Personal Document, which is Amazon’s name for anything that you didn’t buy from them. Yeah, but plenty of my e-books that I didn’t buy from Amazon don’t have it, which is why my puzzlement. Too bad Myth Busters went away. I’d love to see it test the myth that Kindles actually auto-update. I don’t recall that ever happening to my Kindle 3.